What is a UEZ? An Urban Enterprise Zone (UEZ) is a specially designated area in which businesses and residents alike are afforded certain state tax benefits. 1 What is a UEZ? An Urban Enterprise Zone (UEZ) is a specially designated area in which businesses and residents alike are afforded certain state tax benefits. In turn, businesses remit a percentage of their tax savings to the local Urban Enterprise Association (UEA) who manages these funds for the benefit of the Zone. 2 What is a UEZ? Enterprise Zones were first established in Indiana in 1983 under IC 5-28-15. Enterprise Zones were first established in Indiana in 1983 under IC 5-28-15. The program is overseen by the Indiana Economic Development Corporation (IEDC). The program is overseen by the Indiana Economic Development Corporation (IEDC). 3 What is a UEZ? 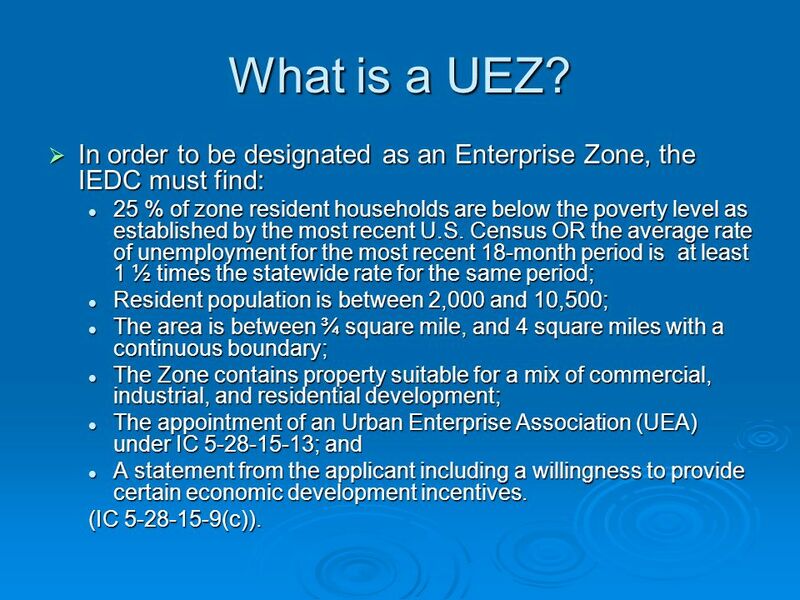 In order to be designated as an Enterprise Zone, the IEDC must find: In order to be designated as an Enterprise Zone, the IEDC must find: 25 % of zone resident households are below the poverty level as established by the most recent U.S. Census OR the average rate of unemployment for the most recent 18-month period is at least 1 ½ times the statewide rate for the same period; 25 % of zone resident households are below the poverty level as established by the most recent U.S. Census OR the average rate of unemployment for the most recent 18-month period is at least 1 ½ times the statewide rate for the same period; Resident population is between 2,000 and 10,500; Resident population is between 2,000 and 10,500; The area is between ¾ square mile, and 4 square miles with a continuous boundary; The area is between ¾ square mile, and 4 square miles with a continuous boundary; The Zone contains property suitable for a mix of commercial, industrial, and residential development; The Zone contains property suitable for a mix of commercial, industrial, and residential development; The appointment of an Urban Enterprise Association (UEA) under IC 5-28-15-13; and The appointment of an Urban Enterprise Association (UEA) under IC 5-28-15-13; and A statement from the applicant including a willingness to provide certain economic development incentives. A statement from the applicant including a willingness to provide certain economic development incentives. (IC 5-28-15-9(c)). 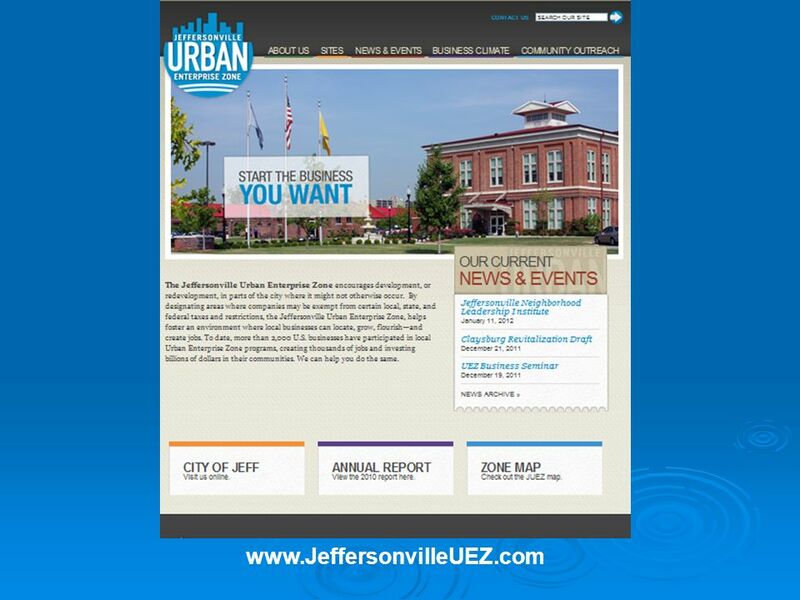 4 The Jeffersonville Urban Enterprise Association (JUEA) The Jeffersonville Urban Enterprise Zone (JUEZ) was established in 2000, and its existence was renewed for 10 years by a Resolution of the Jeffersonville City Council in 2009. 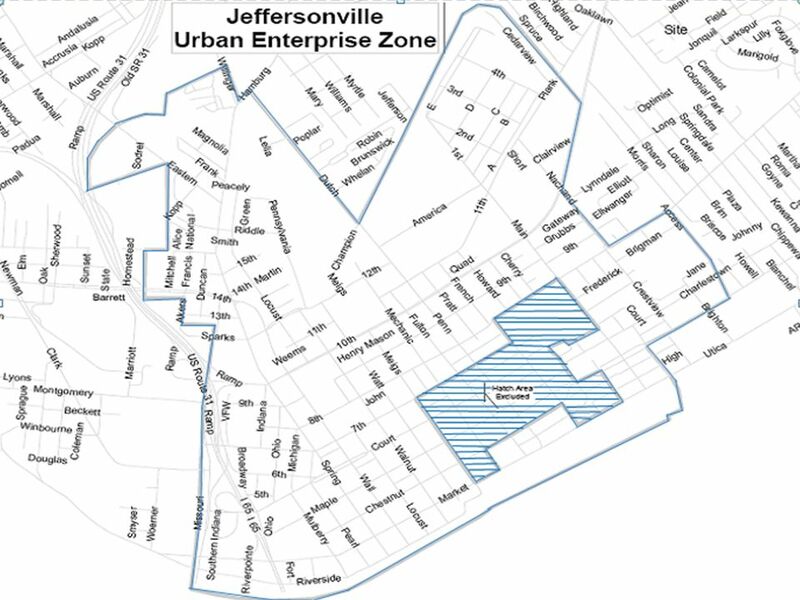 The Jeffersonville Urban Enterprise Zone (JUEZ) was established in 2000, and its existence was renewed for 10 years by a Resolution of the Jeffersonville City Council in 2009. 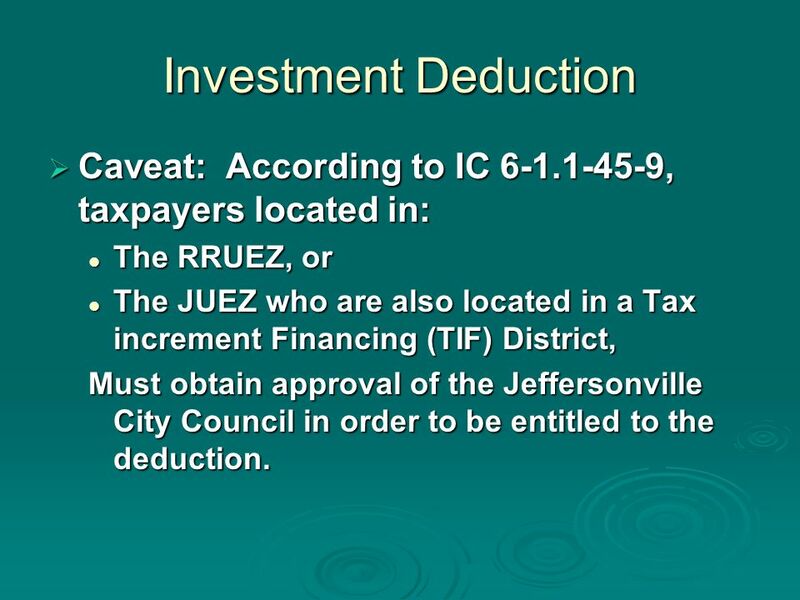 By Resolution of the Jeffersonville City Council, the JUEA now manages funds for the JUEZ. Funds are invested back into the Zone which contributed them. 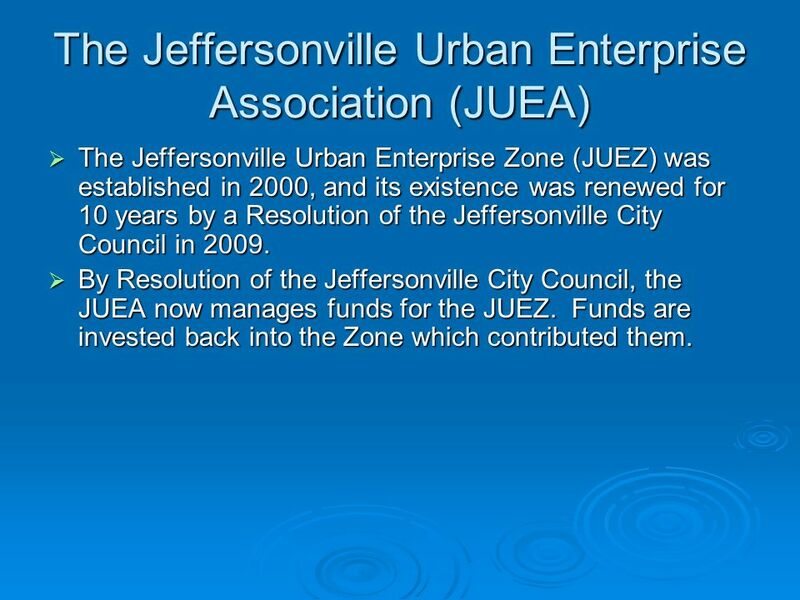 By Resolution of the Jeffersonville City Council, the JUEA now manages funds for the JUEZ. Funds are invested back into the Zone which contributed them. 7 Where does JUEA funding come from? 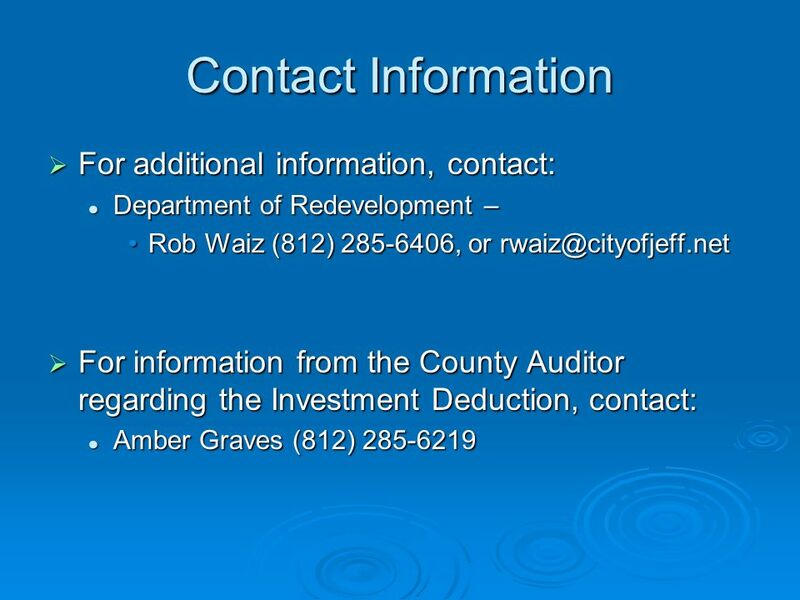 There are several different tax incentives available to Zone businesses and residents. 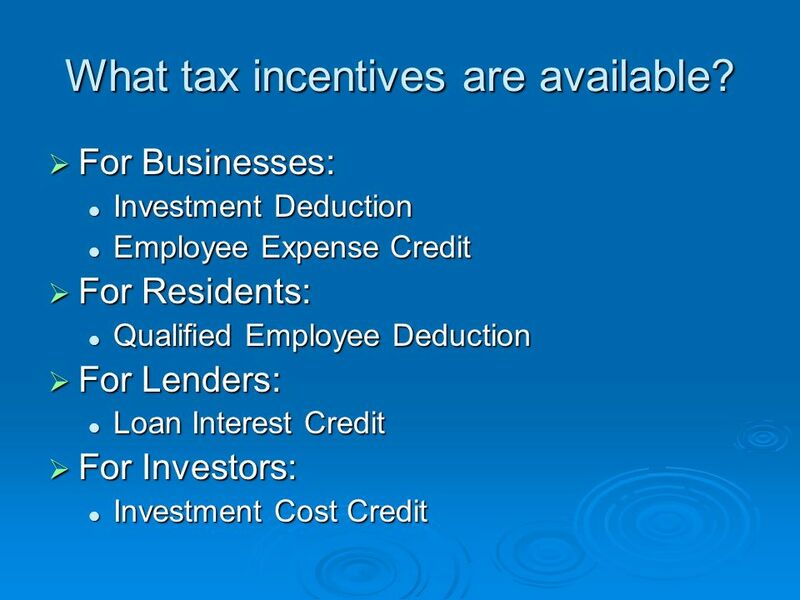 There are several different tax incentives available to Zone businesses and residents. Businesses who take advantage of these incentives, and whose savings as a result of the incentives exceeds $1,000, contribute: Businesses who take advantage of these incentives, and whose savings as a result of the incentives exceeds $1,000, contribute: 1% of their savings to the to the IEDC for program administration, and 1% of their savings to the to the IEDC for program administration, and 49% of their savings to the JUEA for reinvestment into programs benefiting the Zone. 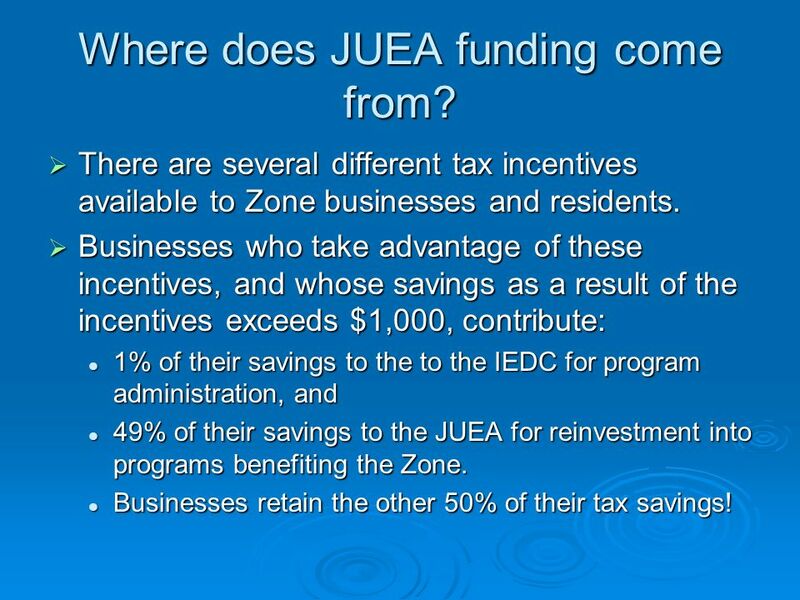 49% of their savings to the JUEA for reinvestment into programs benefiting the Zone. Businesses retain the other 50% of their tax savings! Businesses retain the other 50% of their tax savings! 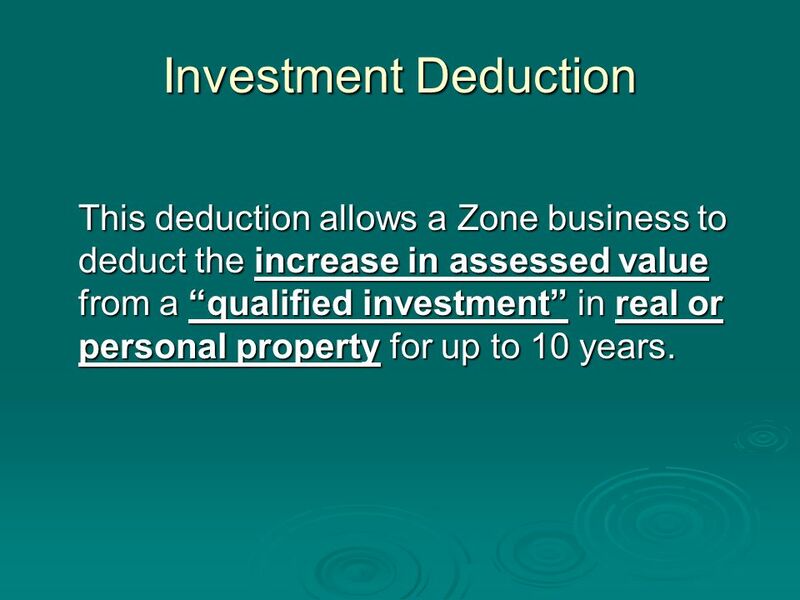 9 Investment Deduction This deduction allows a Zone business to deduct the increase in assessed value from a qualified investment in real or personal property for up to 10 years. 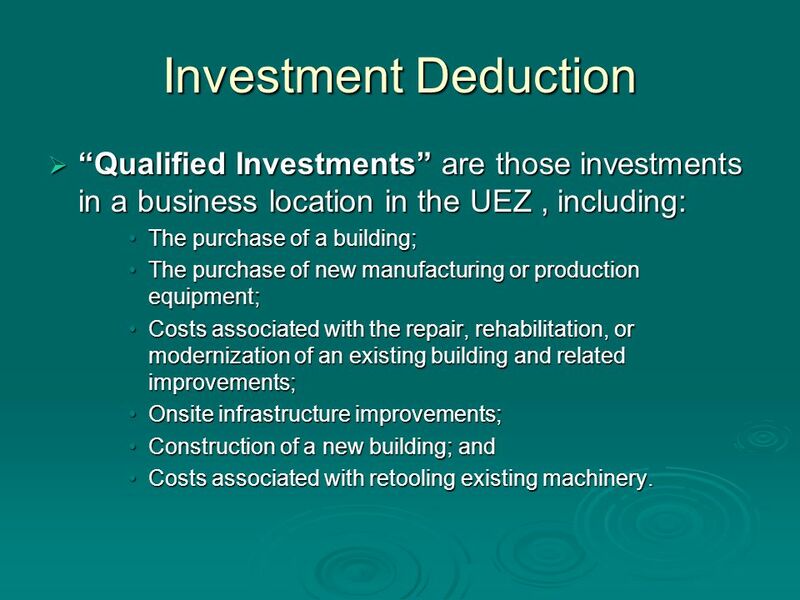 10 Investment Deduction Qualified Investments are those investments in a business location in the UEZ, including: Qualified Investments are those investments in a business location in the UEZ, including: The purchase of a building;The purchase of a building; The purchase of new manufacturing or production equipment;The purchase of new manufacturing or production equipment; Costs associated with the repair, rehabilitation, or modernization of an existing building and related improvements;Costs associated with the repair, rehabilitation, or modernization of an existing building and related improvements; Onsite infrastructure improvements;Onsite infrastructure improvements; Construction of a new building; andConstruction of a new building; and Costs associated with retooling existing machinery.Costs associated with retooling existing machinery. 11 Investment Deduction For the purposes of the deduction, the increase in assessed value is determined beginning with the assessed value on the assessment date in the calendar year immediately preceding the year in which a qualified investment is made. 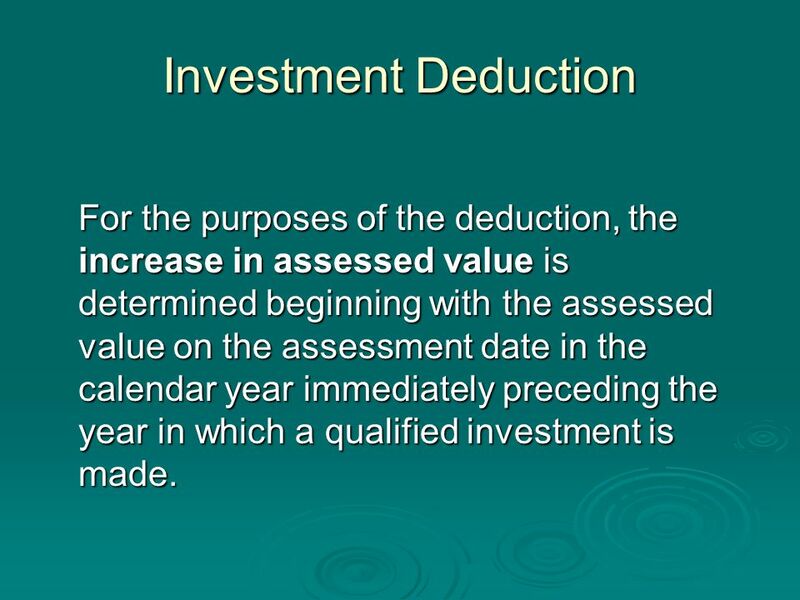 13 Investment Deduction Allows the Taxpayer a Deduction of 100% of the increase in value as a result of the investment. 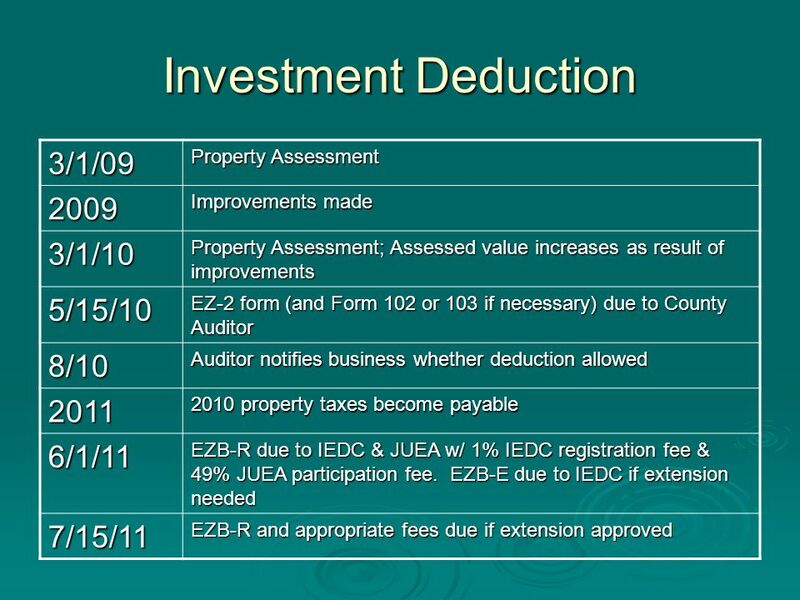 Allows the Taxpayer a Deduction of 100% of the increase in value as a result of the investment. 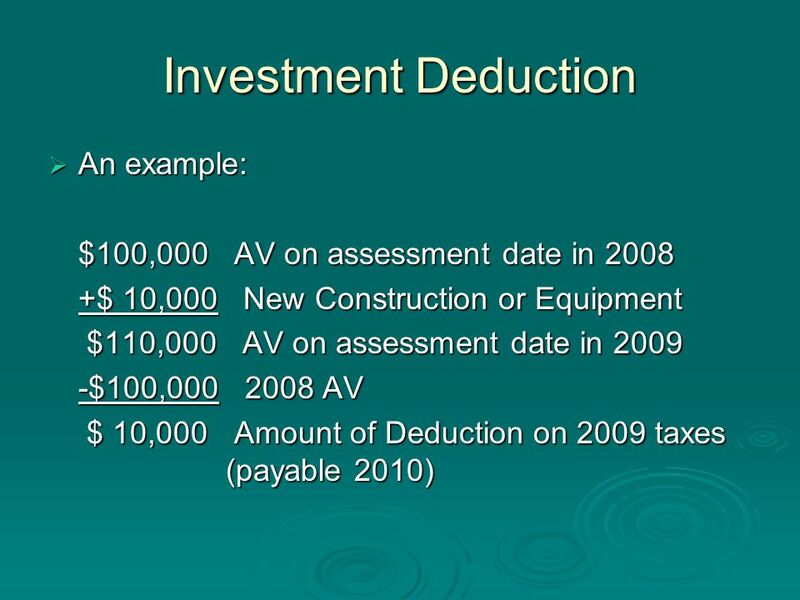 Taxpayers may take the Investment Deduction for up to 10 years. 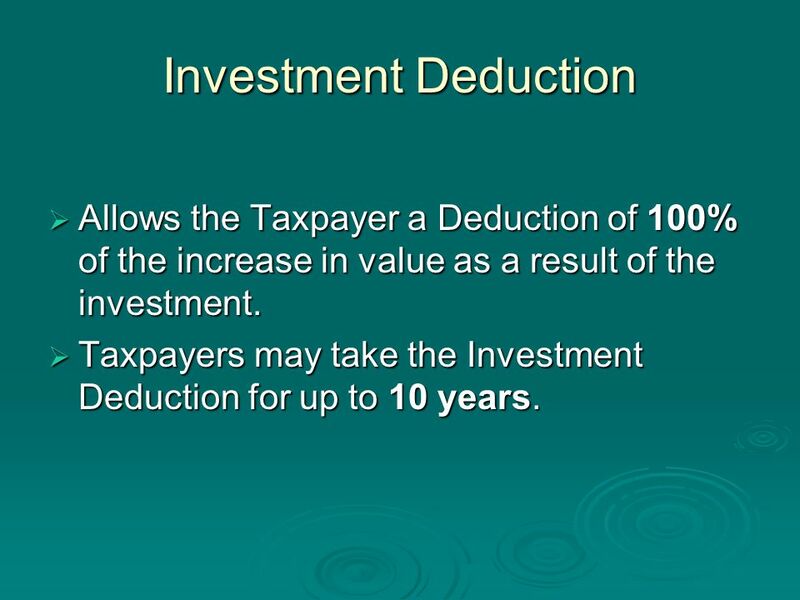 Taxpayers may take the Investment Deduction for up to 10 years. 14 Investment Deduction Caveat: According to IC 6-1.1-45-9, taxpayers located in: Caveat: According to IC 6-1.1-45-9, taxpayers located in: The RRUEZ, or The RRUEZ, or The JUEZ who are also located in a Tax increment Financing (TIF) District, The JUEZ who are also located in a Tax increment Financing (TIF) District, Must obtain approval of the Jeffersonville City Council in order to be entitled to the deduction. 15 Investment Deduction Forms youll need: Forms youll need: Submit form EZ-2 to the Clark County Auditor between March 1 st and May 15th Investment Deduction of the assessment year. 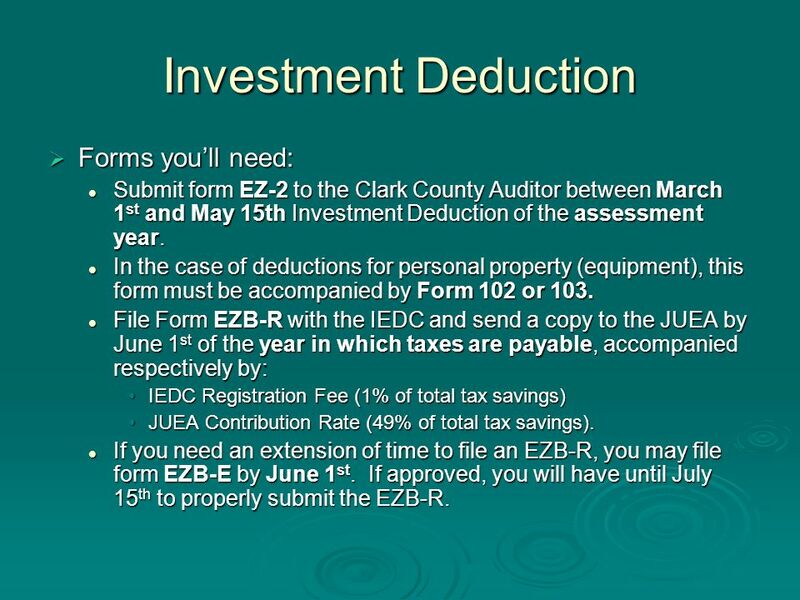 Submit form EZ-2 to the Clark County Auditor between March 1 st and May 15th Investment Deduction of the assessment year. In the case of deductions for personal property (equipment), this form must be accompanied by Form 102 or 103. In the case of deductions for personal property (equipment), this form must be accompanied by Form 102 or 103. 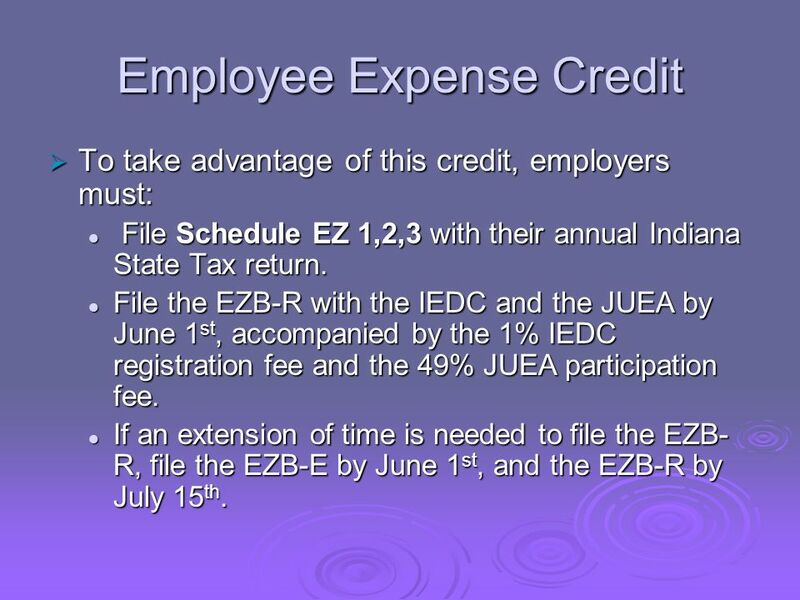 File Form EZB-R with the IEDC and send a copy to the JUEA by June 1 st of the year in which taxes are payable, accompanied respectively by: File Form EZB-R with the IEDC and send a copy to the JUEA by June 1 st of the year in which taxes are payable, accompanied respectively by: IEDC Registration Fee (1% of total tax savings)IEDC Registration Fee (1% of total tax savings) JUEA Contribution Rate (49% of total tax savings).JUEA Contribution Rate (49% of total tax savings). If you need an extension of time to file an EZB-R, you may file form EZB-E by June 1 st. If approved, you will have until July 15 th to properly submit the EZB-R. If you need an extension of time to file an EZB-R, you may file form EZB-E by June 1 st. 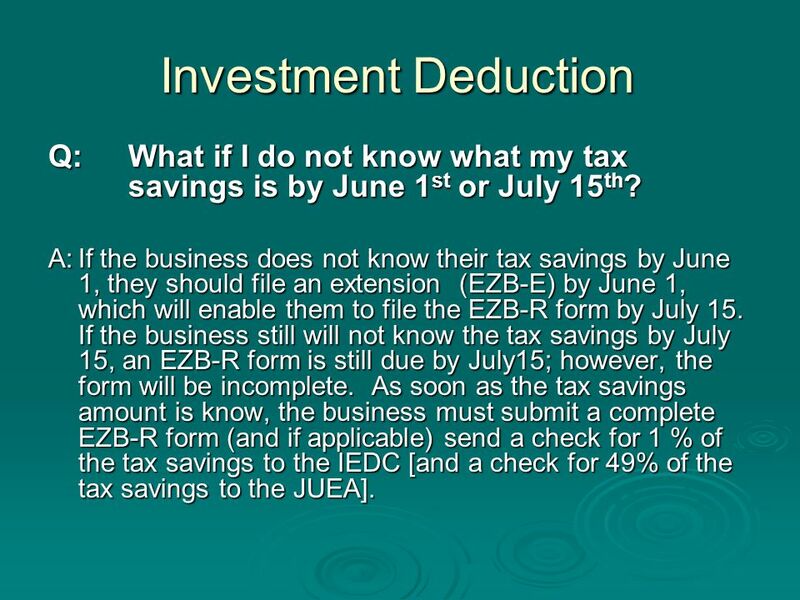 If approved, you will have until July 15 th to properly submit the EZB-R.
18 Investment Deduction Q:What if I do not know what my tax savings is by June 1 st or July 15 th ? A:If the business does not know their tax savings by June 1, they should file an extension (EZB-E) by June 1, which will enable them to file the EZB-R form by July 15. If the business still will not know the tax savings by July 15, an EZB-R form is still due by July15; however, the form will be incomplete. 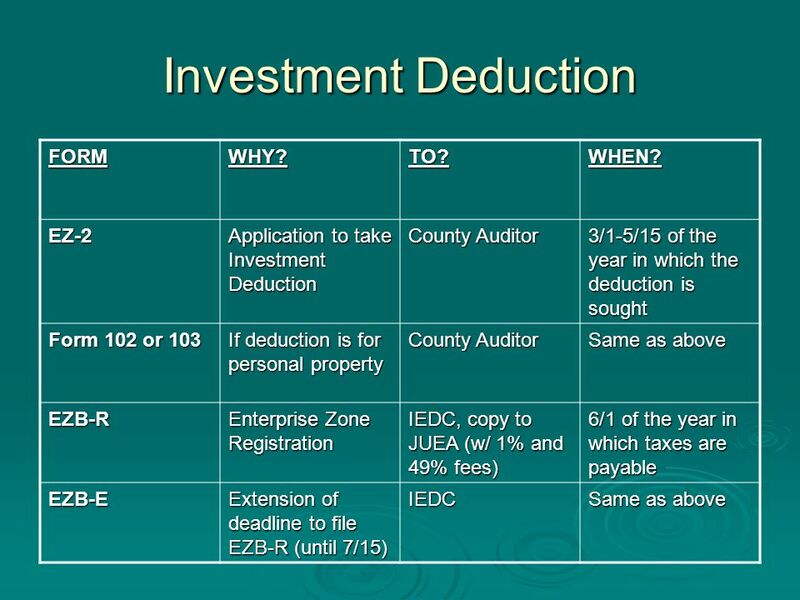 As soon as the tax savings amount is know, the business must submit a complete EZB-R form (and if applicable) send a check for 1 % of the tax savings to the IEDC [and a check for 49% of the tax savings to the JUEA]. 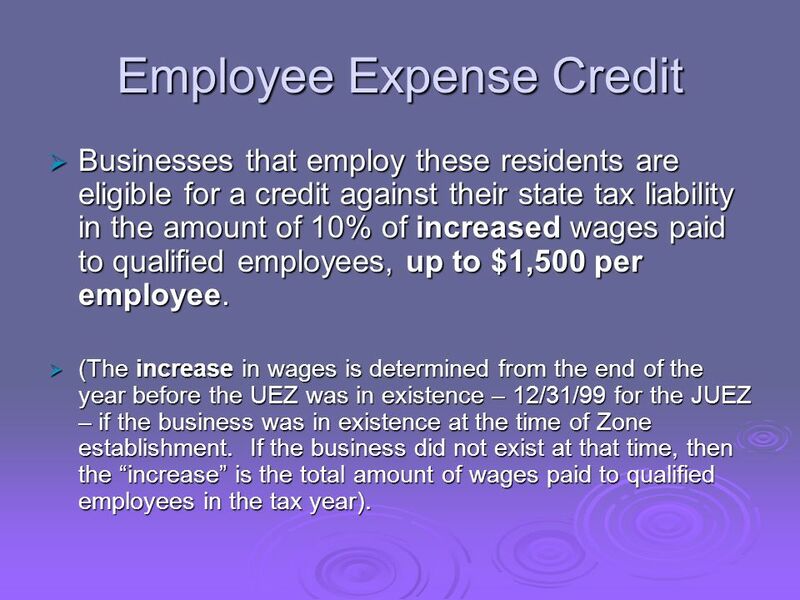 19 Employee Expense Credit This tax credit is earned by businesses that employ qualified employees who are Zone residents. 20 Employee Expense Credit Qualified employees are those who: Qualified employees are those who: have their principal place of residence in the UEZ in which they are employed; have their principal place of residence in the UEZ in which they are employed; perform services, at least 90% of which are directly related to business in the UEZ; and perform services, at least 90% of which are directly related to business in the UEZ; and spend at least 50% of their time working at the UEZ business. spend at least 50% of their time working at the UEZ business. 21 Employee Expense Credit Businesses that employ these residents are eligible for a credit against their state tax liability in the amount of 10% of increased wages paid to qualified employees, up to $1,500 per employee. Businesses that employ these residents are eligible for a credit against their state tax liability in the amount of 10% of increased wages paid to qualified employees, up to $1,500 per employee. (The increase in wages is determined from the end of the year before the UEZ was in existence – 12/31/99 for the JUEZ – if the business was in existence at the time of Zone establishment. If the business did not exist at that time, then the increase is the total amount of wages paid to qualified employees in the tax year). (The increase in wages is determined from the end of the year before the UEZ was in existence – 12/31/99 for the JUEZ – if the business was in existence at the time of Zone establishment. If the business did not exist at that time, then the increase is the total amount of wages paid to qualified employees in the tax year). 22 Employee Expense Credit To take advantage of this credit, employers must: To take advantage of this credit, employers must: File Schedule EZ 1,2,3 with their annual Indiana State Tax return. File Schedule EZ 1,2,3 with their annual Indiana State Tax return. File the EZB-R with the IEDC and the JUEA by June 1 st, accompanied by the 1% IEDC registration fee and the 49% JUEA participation fee. File the EZB-R with the IEDC and the JUEA by June 1 st, accompanied by the 1% IEDC registration fee and the 49% JUEA participation fee. If an extension of time is needed to file the EZB- R, file the EZB-E by June 1 st, and the EZB-R by July 15 th. If an extension of time is needed to file the EZB- R, file the EZB-E by June 1 st, and the EZB-R by July 15 th. 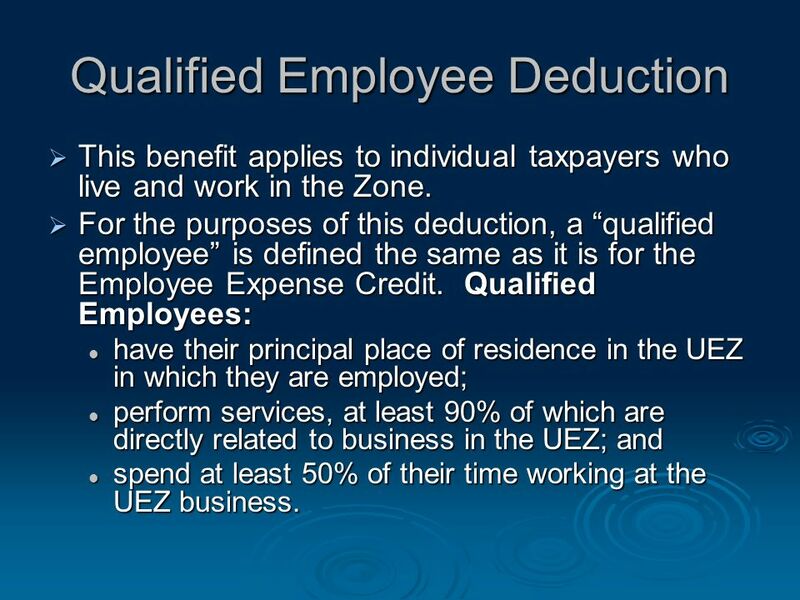 23 Qualified Employee Deduction This benefit applies to individual taxpayers who live and work in the Zone. This benefit applies to individual taxpayers who live and work in the Zone. For the purposes of this deduction, a qualified employee is defined the same as it is for the Employee Expense Credit. Qualified Employees: For the purposes of this deduction, a qualified employee is defined the same as it is for the Employee Expense Credit. Qualified Employees: have their principal place of residence in the UEZ in which they are employed; have their principal place of residence in the UEZ in which they are employed; perform services, at least 90% of which are directly related to business in the UEZ; and perform services, at least 90% of which are directly related to business in the UEZ; and spend at least 50% of their time working at the UEZ business. spend at least 50% of their time working at the UEZ business. 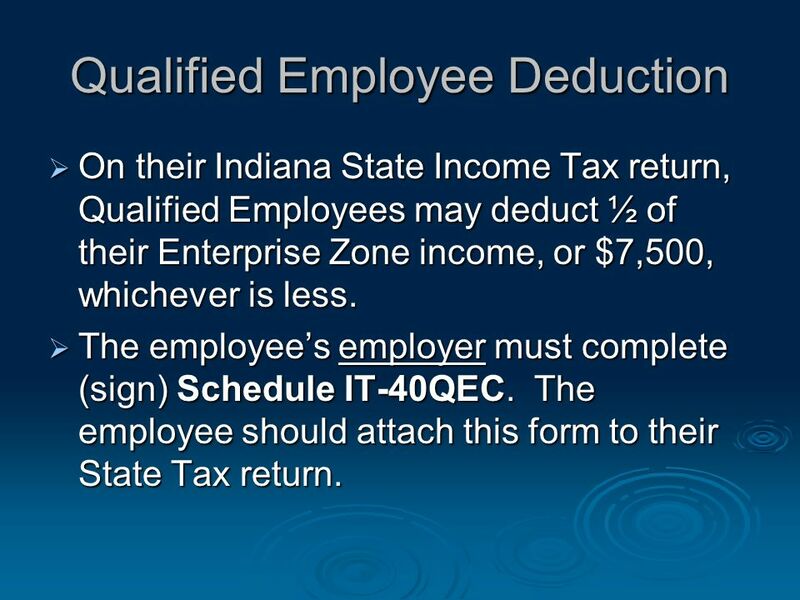 24 Qualified Employee Deduction On their Indiana State Income Tax return, Qualified Employees may deduct ½ of their Enterprise Zone income, or $7,500, whichever is less. On their Indiana State Income Tax return, Qualified Employees may deduct ½ of their Enterprise Zone income, or $7,500, whichever is less. The employees employer must complete (sign) Schedule IT-40QEC. The employee should attach this form to their State Tax return. The employees employer must complete (sign) Schedule IT-40QEC. The employee should attach this form to their State Tax return. 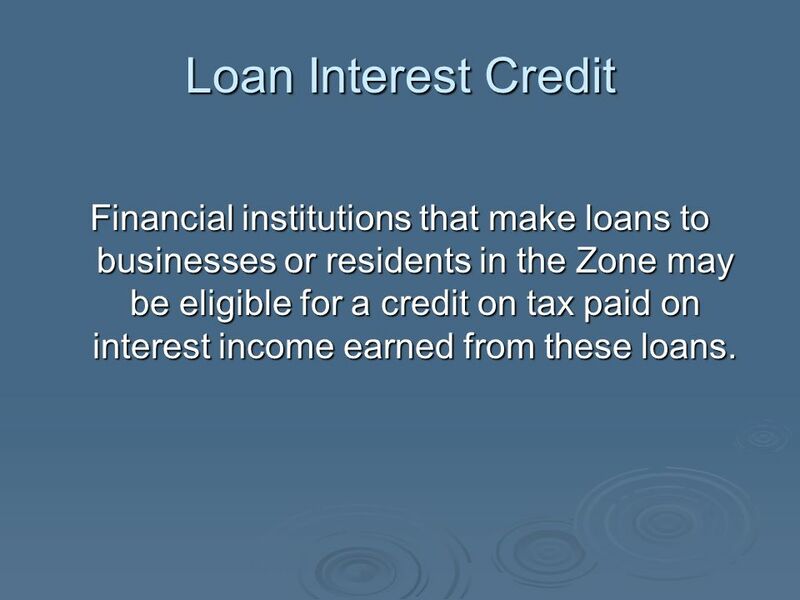 25 Loan Interest Credit Financial institutions that make loans to businesses or residents in the Zone may be eligible for a credit on tax paid on interest income earned from these loans. 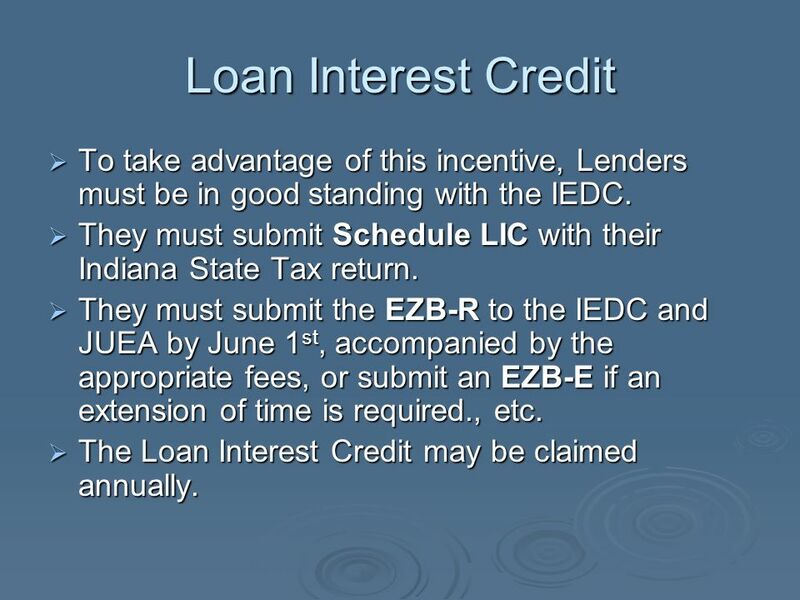 27 Loan Interest Credit To take advantage of this incentive, Lenders must be in good standing with the IEDC. 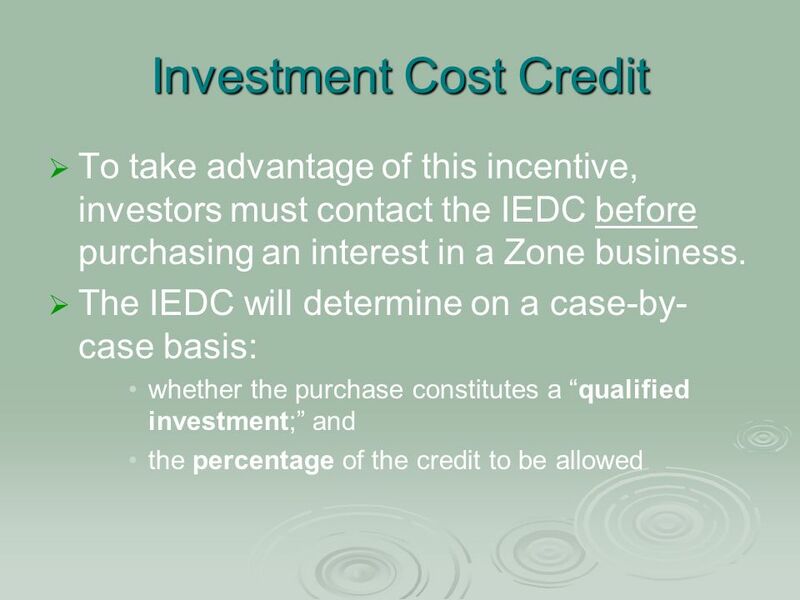 To take advantage of this incentive, Lenders must be in good standing with the IEDC. They must submit Schedule LIC with their Indiana State Tax return. They must submit Schedule LIC with their Indiana State Tax return. They must submit the EZB-R to the IEDC and JUEA by June 1 st, accompanied by the appropriate fees, or submit an EZB-E if an extension of time is required., etc. They must submit the EZB-R to the IEDC and JUEA by June 1 st, accompanied by the appropriate fees, or submit an EZB-E if an extension of time is required., etc. 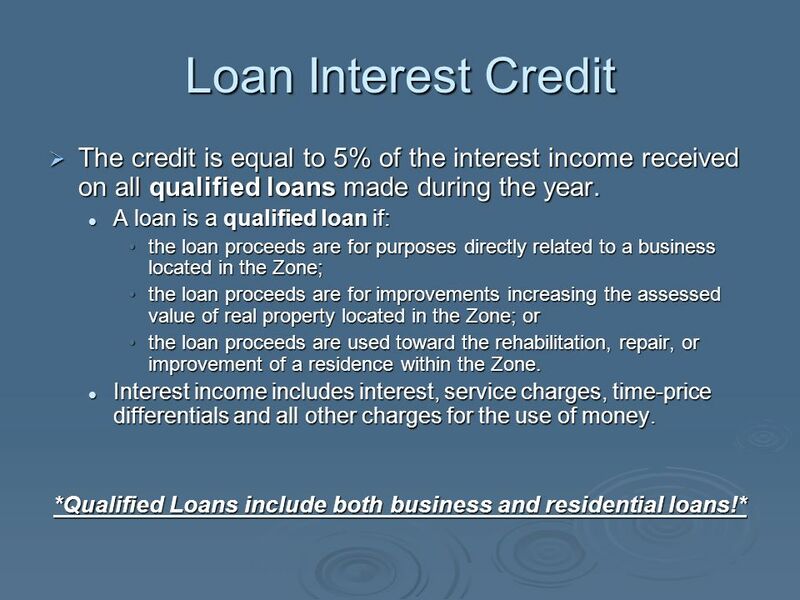 The Loan Interest Credit may be claimed annually. The Loan Interest Credit may be claimed annually. 28 Investment Cost Credit This is incentive is not widely known or applied. It is available to investors in Zone businesses. 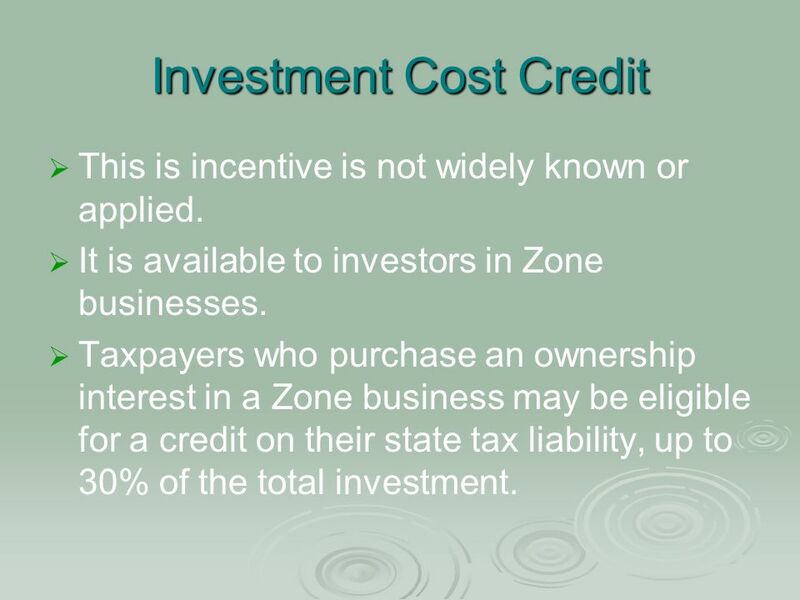 Taxpayers who purchase an ownership interest in a Zone business may be eligible for a credit on their state tax liability, up to 30% of the total investment. 30 Investment Cost Credit A purchase is a qualified investment if: the business is viable; the business has not been disqualified from UEZ incentives or benefits; the taxpayer has a legitimate purpose for the purchase of the interest; the purchase would not be made unless a credit is allowed; and the purchase is critical to the commencement, enhancement, or expansion of business operations in the Zone and will not merely transfer ownership, and the purchase proceeds will be used only in business operations in the Zone. The percentage of the credit depends upon: the type of business (e.g. 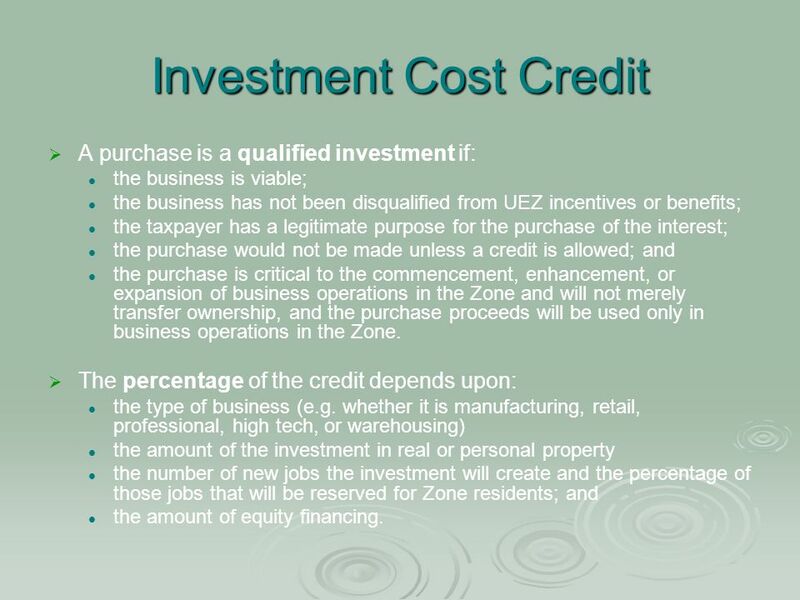 whether it is manufacturing, retail, professional, high tech, or warehousing) the amount of the investment in real or personal property the number of new jobs the investment will create and the percentage of those jobs that will be reserved for Zone residents; and the amount of equity financing. 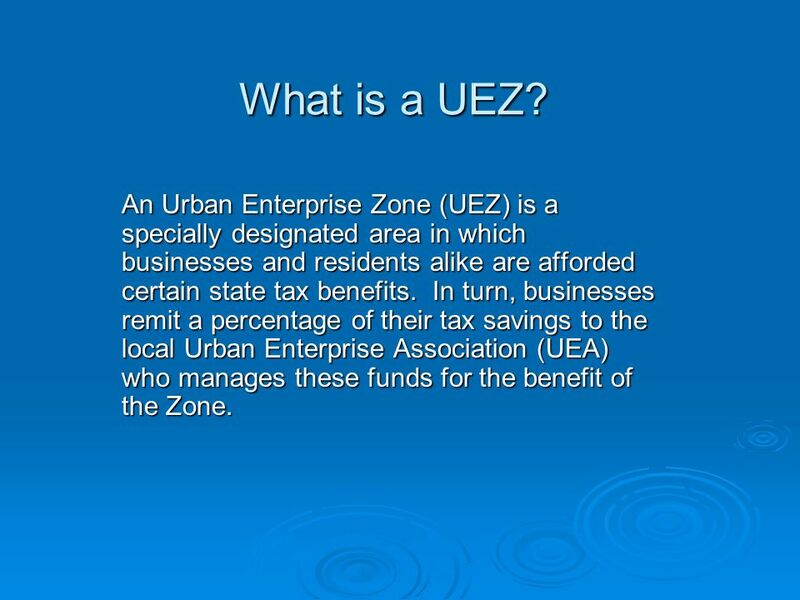 Download ppt "What is a UEZ? An Urban Enterprise Zone (UEZ) is a specially designated area in which businesses and residents alike are afforded certain state tax benefits." The Department of Education Presented to the Senate Finance and Assembly Ways & Means Joint Committee March 10, 2009. 1 Empire Zone Basics WATERTOWN EMPIRE ZONE March 2007. 2-1 Copyright 2010 McGraw-Hill Australia Pty Ltd PowerPoint slides to accompany Croucher, Introductory Mathematics and Statistics, 5e Chapter 2 Percentages. Michael J. Goldman Nixon Peabody LLP Financing Wind Power: The Future of Energy Introduction to New Markets Tax Credits May 9, 2008. Incentives for Historic Preservation in Detroit Michigan Tax Incentives Part I: Michigan Historic Tax Credits and OPRA Detroit Athletic Club June 5, 2008.
Financing Green Affordable Housing Herbert F. Stevens Nixon Peabody LLP. Michael J. Goldman Nixon Peabody LLP Financing Wind Power: The Future of Energy Introduction to New Markets Tax Credits July 25-27, 2007. SGB Orientation Finance Workshop Presented By: Darren Ramdin Associate Director Association for Computing Machinery, Inc. Office of Financial Services.